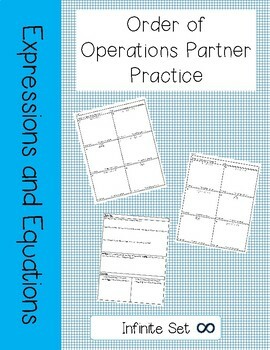 Students work in pairs to practice order of operations with exponents. Each partner solves a different problem but their answers will be the same. 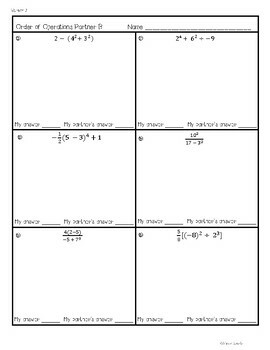 If they are different, students will work together to identify and fix their errors. There are two versions of this activity. 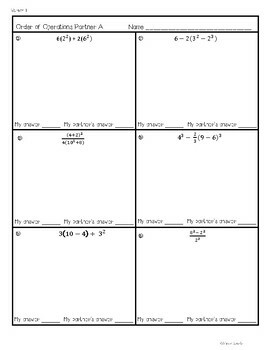 Page 12 is a reflection and extension of the activity. You can copy it back to back with each partner sheet. Students work in partners. One partner has Partner A worksheet and the other has Partner B. Each student solves their individual problem and records the answer. When both partners are finished they share their answers. If the answers are the same, great! They can move on to the next problem. If the answers are different, one or both partners made a mistake. They should go back and check each other’s work until they find and explain the mistake.